I work in a glass box. 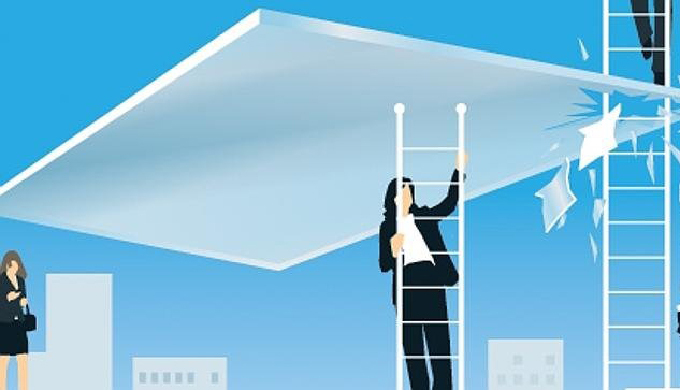 In higher education, as elsewhere, the cultural barriers to workplace progression for women, often referred to as the glass ceiling, are well reported. The glass floor of the box, one the other hand, is less common, and stems from my discipline – law. In legal education there tends to be a requirement for teaching-focused staff to have relevant academic or workplace experience, thus presenting an opportunity for people other than the archetypal PhD student to teach seminar classes and get involved with the administrative and management aspects of academic life. This means that in my department, as elsewhere in law, a large proportion of teaching-focused staff are recruited from the swathe of female lawyers who exit the profession in mid-life due to its notoriously hostile environment for working parents. Universities find that our education, professional qualifications and skills, and experience of working collaboratively make us great teachers and colleagues. For these reasons we can take a step up to the glass floor of a new role in academia at the time that many of our peers are struggling to return to meaningful employment after becoming parents. But we work between glass walls as well, and they’re not immediately apparent. They have been constructed over time by the university as a legacy of an outdated interpretation of what an academic career should be. As a result, they create barriers to sideways and upwards career progression for teaching-focused staff that are systemic and, in the case of law, gendered. University policies relating to promotion and selection that were written to support the classic career trajectory of the classic academic are not fit for purpose when ambitious teachers want to develop and progress our equally valuable careers. In my department I have repeatedly seen that ostensibly neutral terms in the promotions policy relating to external validation, combined with the insufficient recognition of pastoral roles and a narrow role-based interpretation of seniority, downplay the importance of teaching-focused staff in the cultural life of the university and result in the stagnation of women’s pay. Following more than 15 years spent as a highly regarded law teacher, solicitor, manager, pastoral adviser and colleague – in which time I have watched younger and less experienced, predominantly male colleagues get promoted before me and recruited above me – I have had enough. The release of the myriad of dismal and depressing gender pay gap reports across the sector demonstrate that my experience is not unique, and that it is time for the voices of female teaching-focused staff to be heard, and for universities to effect change. So what can be done? How can the group to which I belong raise our profile, recognition and pay in universities? In the aftermath of the abysmal gender pay gap reporting there has been an encouraging level of activism to push for pay equality among academic staff, such as the call by staff at the University of Birkbeck to pursue collective equal pay claims. However, to date, the predominant focus has been on ensuring equality of pay between men and women in classic academic roles which, although valuable, does not address the indirect and nuanced discrimination I have experienced as a teaching-focused member of staff. The sector’s focus on the proposed teaching excellence framework could be a catalyst for this conversation and could provide a way to strengthen the voice of teaching-focused staff within university governance. At a departmental level, more conversations about individual career progression ambitions need to take place, with an emphasis on the need for greater recognition of, and reward for, the pastoral skills that are so highly valued by our students. If these conversations and the requisite concurrent conversations with the labour unions do not lead to change, litigation is also a possibility. My experience has shown that there is an urgent need for greater collective endeavour to highlight the boundaries of the unique space filled by teaching-focused staff within the cultural life of the university. We need to demonstrate that although the focus of our work is not the same as our research-focused colleagues, it is equally valuable. For this I need help because another problem with working in a glass box is that nobody can hear you shout. Author Bio: The author is a law teacher working in higher education.